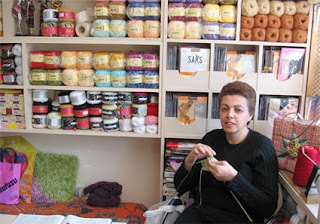 I am buying all my yarns from Dikiş Kutusu (The Sewing Box). The main reason is because they are caring ONLY high quality yarns and knitting accessories. 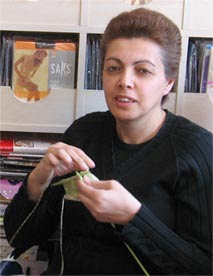 The lady owner, Ms. Vildan, is so helpful with lots of recommendations and instructions, you could say she will do the knitting herself for you! Ms.Vildan, the yarn store owner and the most talkative (in a good way) knitter. If you are short of inspiration, just drop in and you will leave with a bag full of stash and ideas. it is nice to have a favorite LYS. my favorite (altough i don't shop there due to high prices) is Galeri 77, i love to look through their window and see all the craft items they display.. unfortunately one of the favorites of my mine went out business last week..
Oh I love having found your blog - particularly advocating a favourite LYS in Istanbul, where i hope to be visiting this year. What better outing to make, than one to the LYS!